Blair - Blair, 9780895873576, 259pp. Mile for mile, St. Simons Island--one of Georgia's Golden Isles--boasts as much history as any community on the East Coast. Originally an Indian hunting ground, it has been occupied or invaded by Spanish missionaries, British settlers, planters and their slaves, the Union army, the United States Navy, and developers and tourists. The seventeen narratives in Voices from St. Simons represent an "oral archaeological dig," writes editor Stephen Doster. Many of those interviewed are descendants of masters and slaves. Surprisingly, they speak of racial issues with greater compassion than bitterness. But the volume encompasses much more than that. Here, the people of the Golden Isles recall waving farewell to Paul Redfern when his airplane took off from a sandy beach on his ill-fated attempt to outdo Charles Lindbergh. They describe jumping into a fast boat and riding to the rescue of merchant sailors torpedoed by a German U-boat. They tell of playing childhood sports--and dominating the competition--alongside future NFL legend Jim Brown, who was raised on St. Simons. They remember piloting the ship that, due to a helmsman's error, hit the Sidney Lanier Bridge, causing one of the worst such disasters in American history. "In some respects, the narratives reveal a plot of ground that time forgot," Doster writes. "They present the reflections of a cross-section of ordinary people who lived during extraordinary times." Stephen Doster was born in 1959 in Kingston-Upon-Thames, England, and moved with his parents and four siblings to St. Simons Island, Georgia, in the early 1960s. His ties to the island date to the early 1900s, when his father's family vacationed there before the construction of a mainland causeway. His grandparents permanently moved to St. Simons in the 1940s, building on the grounds where a Spanish mission once stood. Growing up on the island, Doster remembers the place as a "Mayberry with tides," where he and neighborhood kids played baseball on the beach, sneaked into a resort hotel pool after football practices, and explored the island's woods and tidal creeks. His early recollections include seeing navy hurricane hunters fly over the Atlantic in search of storms before the days of satellites, viewing open Indian graves during an archaeological dig, evacuating the island at Hurricane Dora's approach, and returning to the destruction left in its wake. After graduating from the University of Georgia with a Bachelor of Business Administration degree in 1983, Doster headed to Nashville, Tennessee where he has lived and worked since. Though he has been a resident of Nashville for over 20 years, St. Simons has always been close to his heart. In 2002, John F. Blair published his debut novel, Lord Baltimore, about a young man's journey on the Georgia coast between Savannah and St. Simons. 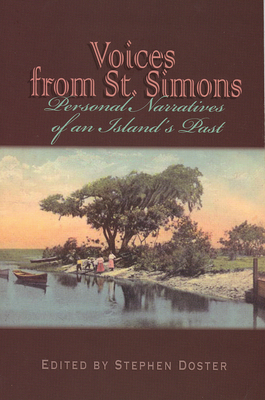 Voices from St. Simons is essentially Doster's effort to preserve the legacy of the area. For decades, he heard "local residents utter the famous sentiment that someone should have recorded so-and-so's recollections before she died." Reading the obituary of a former elementary school teacher inspired him to set up face-to-face and telephone interviews that began his oral archaeological dig. Doster works at Vanderbilt University and lives in Nashville with his wife, Anne.